This filament kit contains four spools of 1.75 mm ECO ABS filament, including ECO ABS Light Grey, ECO ABS Blue, ECO ABS Silver, and ECO ABS Green. All material types in the ECO filament range are produced in a sustainable way and made of high-quality granules. The manufacturing process is well tested and controlled which makes the ECO filaments persistent in both shape and diameter. Each spool of filament is packed in a vacuum sealed plastic bag, and is covered and protected by a cardboard box. 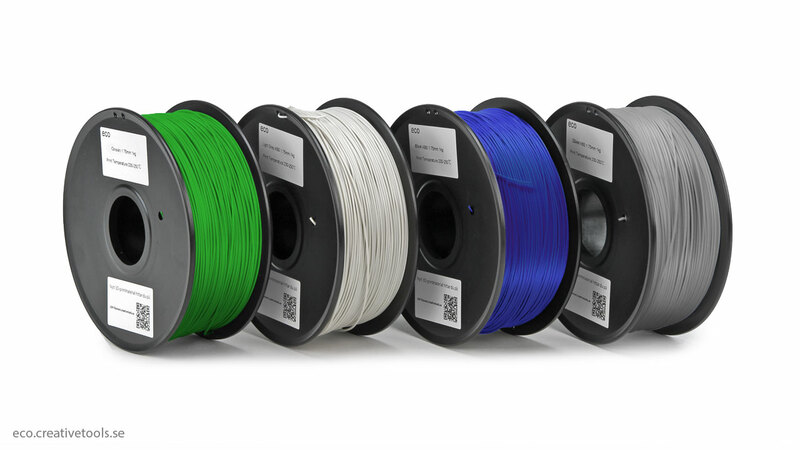 The ECO ABS filament range consists of filaments in a variety of eye-catching colors. The filament is made with high-quality ABS (Acrylonitrile Butadiene Styrene), which is a very impact resistance and tough thermoplastic polymer. This filament can be used for 3D printing with any 3D printer model that is capable of printing with ABS. The filament will last longer if you keep it in its packaging (sealed) when you are not using it. We recommend covering the build platform with Kapton Tape for best adhesion. See MSDS for ECO ABS here (PDF). This kit with five spools of 1.75 mm ECO PLA filament gives a colourful start to your 3D printing..